The small community of Virginia Dale, Colorado, has a very significant claim to fame: the last remaining stage station of the Overland Trail! The Virginia Dale stage station was established in 1962 by Jack Slade and probably named after his wife Virginia. Dale is another word for a glade. Despite claims of the stage station and the associated Hurzelers cabin being visible from the public county road 43 F, I found that this road was actually marked with "Private Property" and "Do Not Enter" signs. Since I had just been angrily barked at by large dogs while filming the old Virginia Dale post office and cafe, I refrained from exploring this "private property" any further. There was also a bit of time pressure, because my friend Lisa Fox was visiting from Oakland and we were on our way to see Laramie, Vedauwoo, the big Lincoln head and the Ames pyramid in Wyoming. 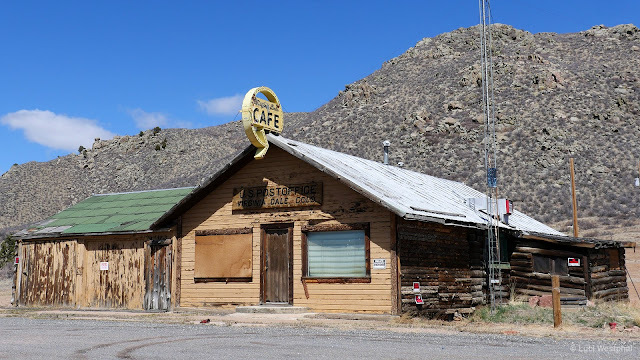 On another day, I might try to explore the Virginia Dale ghost town further. But for now, I can only share a video featuring the post office, the private/county road, the scenery and Highway 287, which is what the local section of the Overland Trail has turned into. The song in the video is “Folk Bed” by Jason Shaw of Audionautix. He has made this and many great tunes available via a CC BY 3.0 license. Thank you so much again and again, Jason! I’ll be posting a few photos of Virginia Dale throughout this week to the In A Colorado Minute 2017 Flickr album, on Google+ and Facebook.